The chapter deals with the most pressing issues in Israel’s healthcare system, including the balance between public and private funding, management of the health funds and commercial insurance companies, and preparations for Israel’s aging population. Stability in overall health spending and a decrease in the share of public spending on health mean that, in order to receive adequate medical care, Israelis need to spend more of their private budgets on healthcare. These trends lead to growing gaps in access to health services between households of different incomes levels and between the different geographic regions in Israel. Healthcare spending as a share of GDP has remained fairly stable over the past two decades, at about 7% of the GDP, compared to 10% on average in other OECD countries. However, the share of public funding out of the total national expenditure on health dropped: from about 70% to 61% (compared to about 77% in the OECD). These trends, in addition to the growing demand for medical services due to Israel’s aging population alongside a reduction in the supply of medical personnel, contribute to a rise in medical prices (relative to the general price index). Thus, disparities in access to health services are increasing among households with different income levels. The government’s share in financing health services is 15 percentage points lower than the OECD average. Consequently, private expenditure on health out of total household expenditure has increased in Israel: from 4.5% in 2000 to 5.7% in 2015. 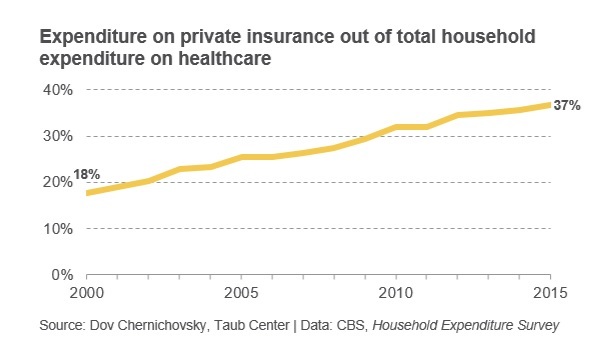 The primary reason for the increase in private expenditure is the purchase of private insurance plans, which rose from 18% in 2000 to 37% in 2015. This means that Israelis need to spend more out-of-pocket in order to receive proper care in private clinics, even though the care is administered by doctors from the publicly-funded system whose work in the private sphere leaves facilities in the public system underutilized. The current situation is causing inefficiencies in the system, and gaps in access to health services are widening between households of different income levels and between the different geographic regions in Israel. Of the citizens who report use of private medical services, 42% said they did so in order to select the physician of their choice. Another 22% turned to private healthcare in order to get an earlier appointment. The increasingly common trend of health funds (which are non-profit institutions) and commercial insurance companies acquiring private medical facilities raises questions about induced demand for privately-financed medical procedures and unnecessary spending, freedom of choice in the system, and the public-private mix in Israel’s health system. The government has taken several steps to improve medical services for the elderly, including raising the maximum allowance for elderly long-term care to NIS 5,000, discontinuing financial means tests for children of long-term care recipients (used to determine the subsidy level for such care), and arranging the immediate transfer of those insured through group insurance via their workplace to health fund insurance. Nonetheless, Israel’s long-term care system is inferior to that in other developed countries, is largely funded by private expenditure, and is fragmented across a number of government agencies.